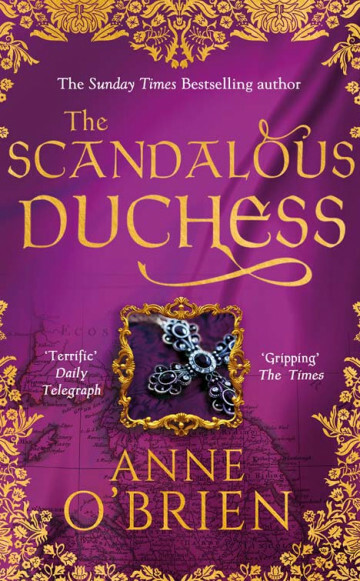 The Scandalous Duchess takes us into the relationship between Katherine de Swynford and John, Duke of Lancaster, a relationship that broke all the rules but survived the censure of church and state. Lady Katherine de Swynford: widowed, respectable, highly principled; a woman with a firm faith and a strong sense of duty to her young family. A woman of education, dignity and integrity. Why would a pious, moral, woman put her reputation and her immortal soul at risk to indulge in so scandalous a relationship at the very centre of the royal court? John, Duke of Lancaster: a man with all the pride and arrogance of a Plantagenet prince, and a reputation for chivalry. An ambitious man with England’s destiny in his hands, since his brother’s tragic death and his father’s decline, as well as a new royal-born Castilian wife to help him further those ambitions. Why would a man of such political standing and such flamboyant ambitions risk all to take a woman of his household so publically as his mistress? And yet Katherine Swynford and John of Lancaster become lovers. This was a love affair that broke all the rules. Abandoning all moral integrity, all sense of responsibility, all thoughts of God’s grace, they embarked on an adulterous affair that lasted for twenty five years. Katherine destroyed her reputation under a deluge of vicious censure that labelled her she-devil and enchantress. The Duke was attacked by church and state for placing his mistress before the demands of England in a time of war and flaunting her, disgracefully, before his new wife. Hounded by scurrilous condemnation, their relationship battered and broken by political and clerical enemies, the lovers were ultimately forced to live apart. But this was no ordinary, light-hearted romantic emotion that would die under the lash of public disgrace. This was a passion, remorseless and relentless in its power, sweeping all before it, all sense of right or wrong, bringing them ultimately together again. "An empowering read that, as ever, has been meticulously researched." "An epic tale of love and loss which is to be admired"
"... packed with powerful emotions and tumultuous unfolding of an affair that changed the course of royal history, this is a novel in which to enjoy the past in all it rich colour and dramatic detail..."
The Scandalous Duchess is the breathtaking story of a very personal relationship in the hotbed of medieval politics, driven by the final uncertain years of a failing Edward III and the uneasy challenges posed by the young Richard II. Told by Katherine Swynford herself, it is the story of a compulsive desire and need that could not be denied.